Spice up your wardrobe with these trendy open toe sandals. Featuring cut-outs, multicolored zig zag crochet upper, platform, glossy heel, rear zipper closure and finished with a cushioned insole. Lights up the room in these gorgeous slingback pumps. Featuring peep toe, scooped front vamp, a sparkling glitter upper, hidden platform, glossy stiletto heel. Finished with adjustable slings and soft insole for walking comfort. Capture all of the heat summer has to offer with these fabulous peep toe wedges. Features snake embossed upper, layered detail on front vamp, covered platform and wedge heel. Finished with padded insole and adjustable buckle closure. Make an easy wardrobe choice with this stylish pointy toe wedge. Featured faux suede upper, scooped vamp with stitching detail, wrapped platform and wedge heel. Removable adjustable ankle strap and finished with cushioned insole. Get noticed in these breathtaking round toe booties. Features nubuck upper, lace up front closure, studded spikes detail at the back, hidden platform, and chunky heel. Finished with smooth lining and padded insole. Platform: 1.5" Shaft Length: 8.75"
With animal prints hitting the runway, take a bite out of couture with these wild zebra print booties. Faux suede trim up the back and leatherette front. Stacked platform wedge heel. Zip at back of ankle. Perfect for walking to class or for dressing up your basic leggings and jeans. This casual oxford flat is simple and stylish. It features leopard print upper, lace up front closure, round toe, and stitching details. Finished with cushioned insole and smooth interior lining for your comfort. Sweeten up your outfit with these attractive peep toe wedges! It features T-strap construction at vamp with gorgeous bow decor on the side, two tone platform, and wedge heel. Finished with lightly padded insole and rear zipper closure for easy on/off. 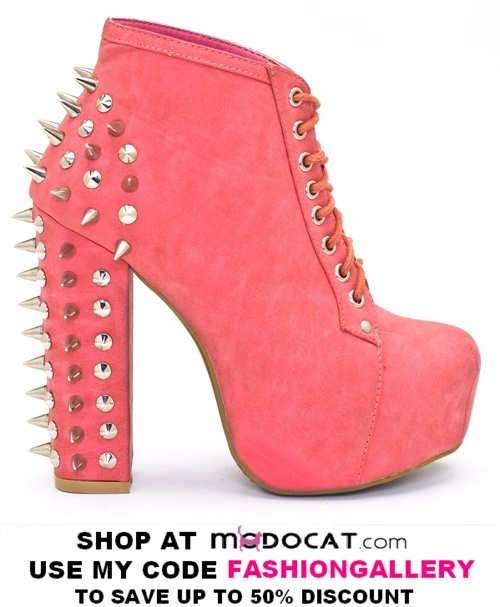 Take fashion to brave new heights with these trendy and tough platform booties! It features square toe, lace-up construction at front vamp, cut-out design at the back, hidden platform, and thick wooden heel. Finished with lightly padded insole and adjustable ankle strap with buckle closure. Run small. Please consider ordering half size up. Tadaaa! Do you find them stunning as well? Hmmm. It's just some of MODOCAT 's products. If you want to see more you should visit their site.